Welcome to The Mad House Christmas tour! I wasn’t sure I was going to get tour pictures taken this year, as it is difficult to maintain a picture perfect room for more than a few minutes around here. I ended up just moving the mess from one room to another in order to get some nice pictures to share. 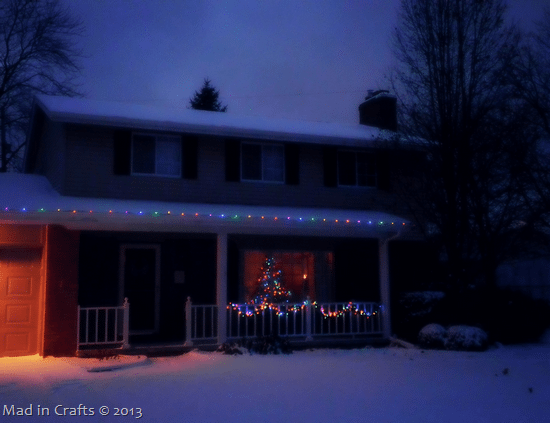 So, don’t worry, friends, our house never looks this nice all at the same time! 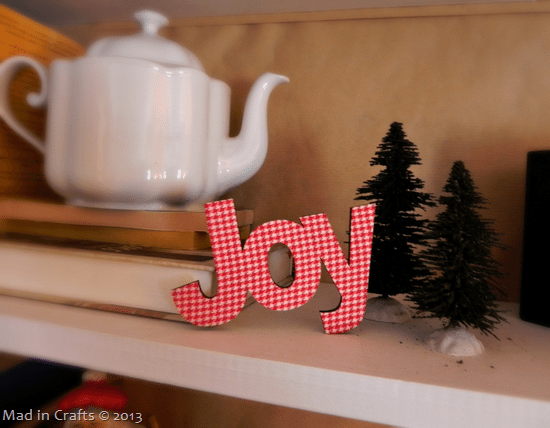 You already know from the Christmas decoration tutorials I have shared this year, that I am mad for plaid! 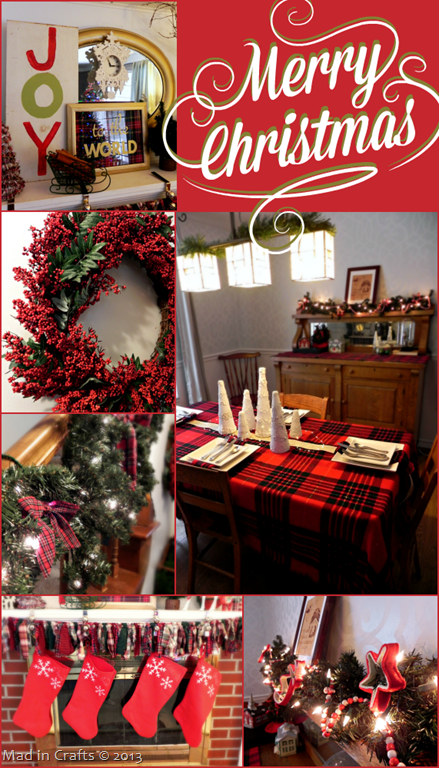 I incorporated tartan fabric wherever possible when decorating this year. I hope you enjoy the tour! 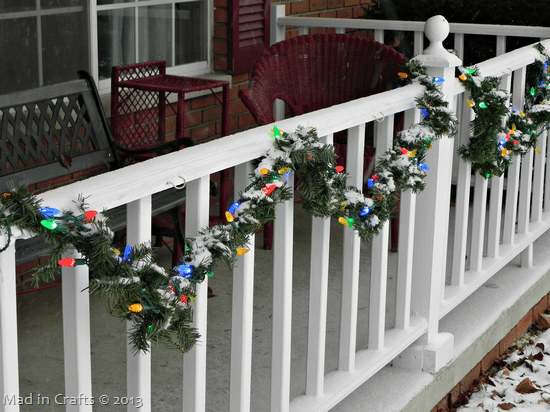 Since we get some pretty harsh weather in the winter around the Mad House, I am keeping our outdoor decorations limited to Christmas lights and simple garland swags. 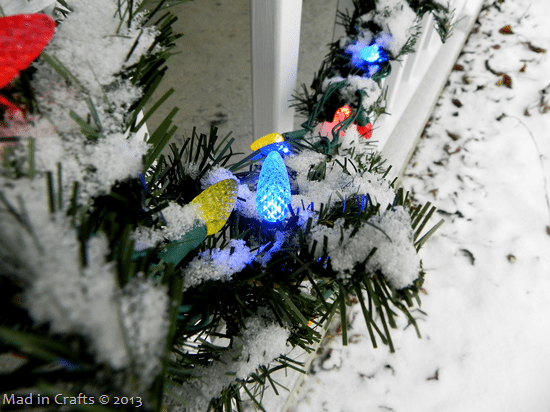 This morning we got just enough snow to make the lighted garland look especially pretty. The winter yarn pom wreath on our front door is protected from snow and ice by our storm door. It is a nice way to welcome Christmas guests into our home. 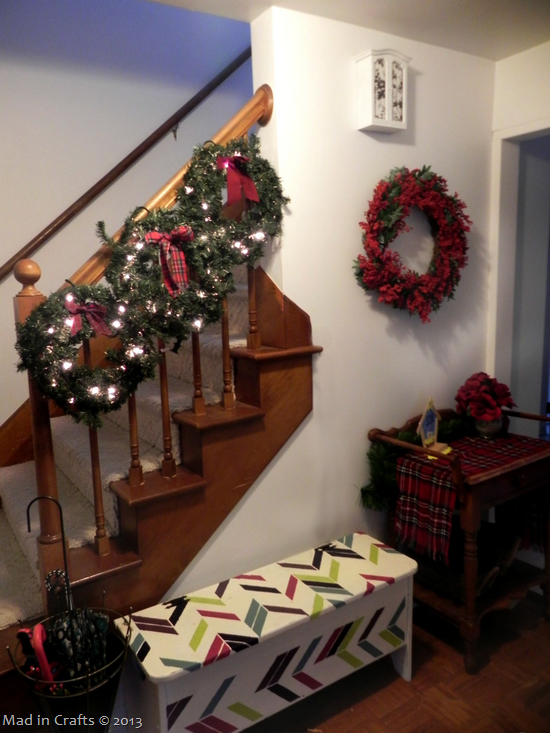 The front entryway got a few seasonal additions to the banister and hall table. I bought these lighted wreaths cheaply last year. 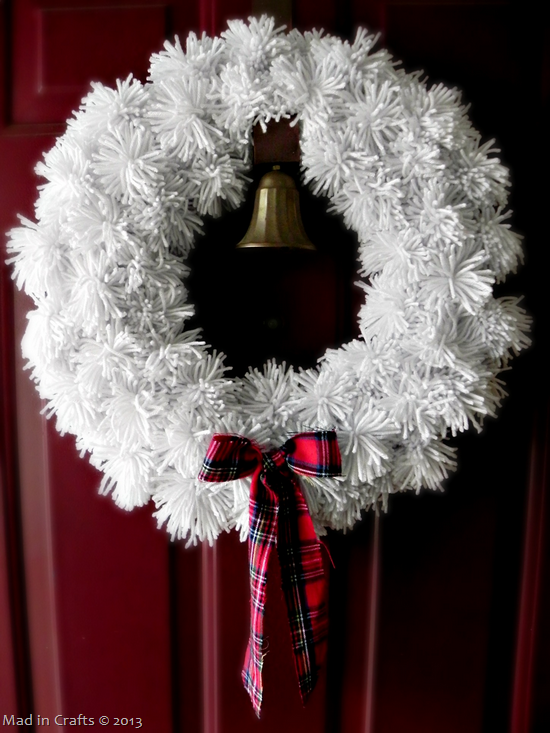 This year, I removed the red velvet ribbon they came with, and replaced them with scraps of plaid fabric to tie the wreaths in with the rest of the house’s decorations. 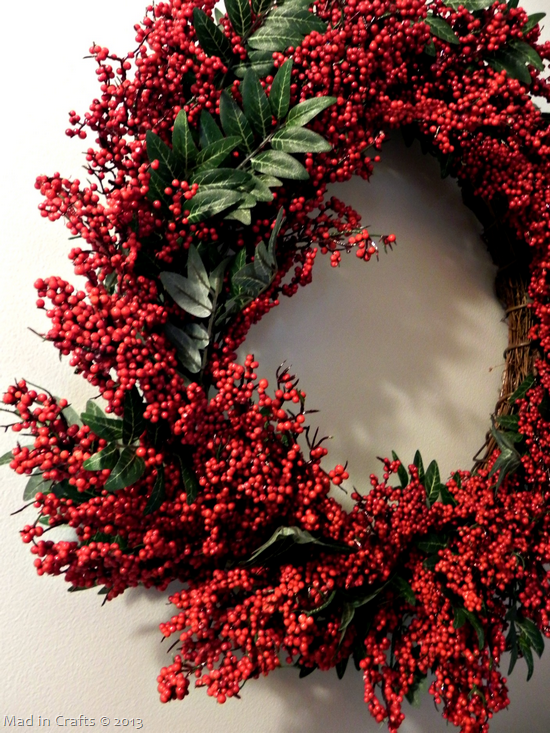 I replaced our hall mirror with this beautiful berry wreath I got from my aunt when she moved. While we have a few decorations in other rooms in the house, most of my Christmas decorating focused on the living and dining rooms. 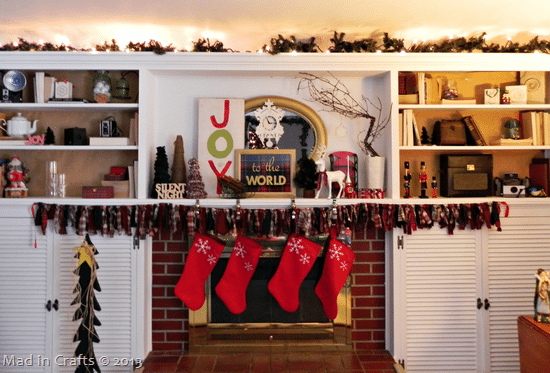 I used brown craft paper to cover up the teal paint behind the built-in bookshelves, and then styled the shelves and mantel with Christmas décor. The paper trick is a quick and cheap way to easily change the look of open shelving. I always struggle with styling my mantel. I second guess all my decisions, and never really end up loving what I have done. 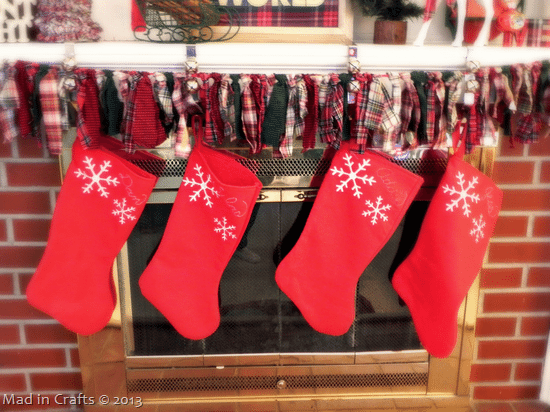 I do like the way this year’s Christmas mantel turned out, however. 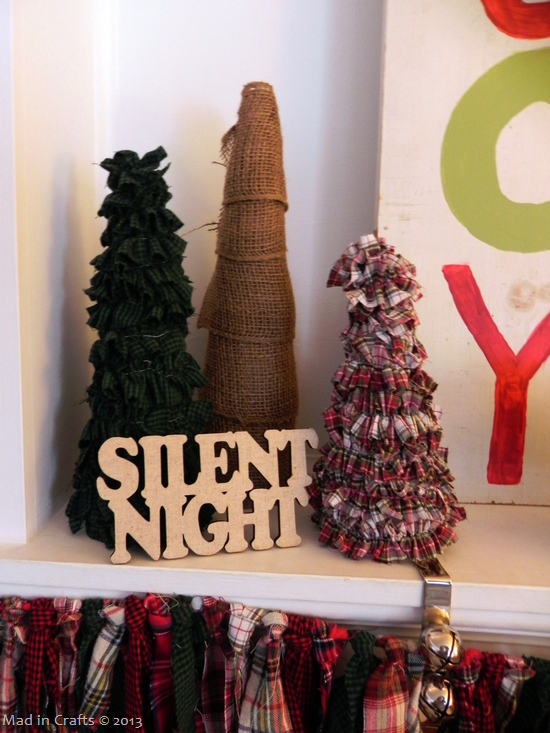 I leaned a wood cut Silent Night sign (from Michael’s dollar bins) against my plaid rag trees. 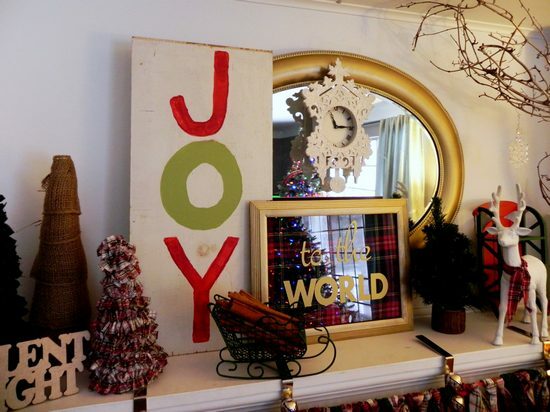 The mantel needed height, so I quickly painted the JOY sign using scrap wood and paint samples. I framed up a piece of plaid fabric and used my new Silhouette to add the “to the world” in gold vinyl. I like the way the lyric centers the mantel. My Goodwill cable knit vase holds some bare branches, and another woodcut sign is propped in front of it. 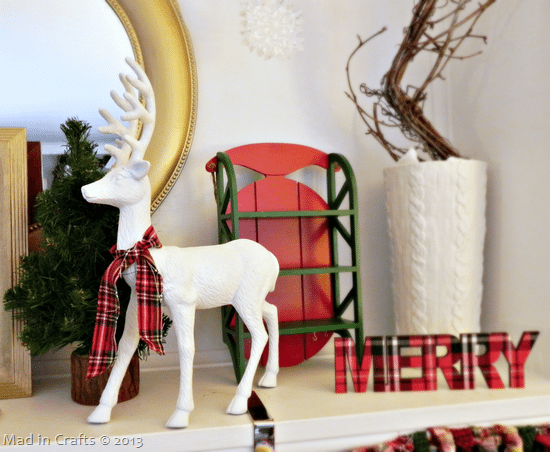 A few other thrift store finds, including my dapper deer, round out the mantel. One last wood cut sign and some dollar store bottle brush trees accent a bookshelf. 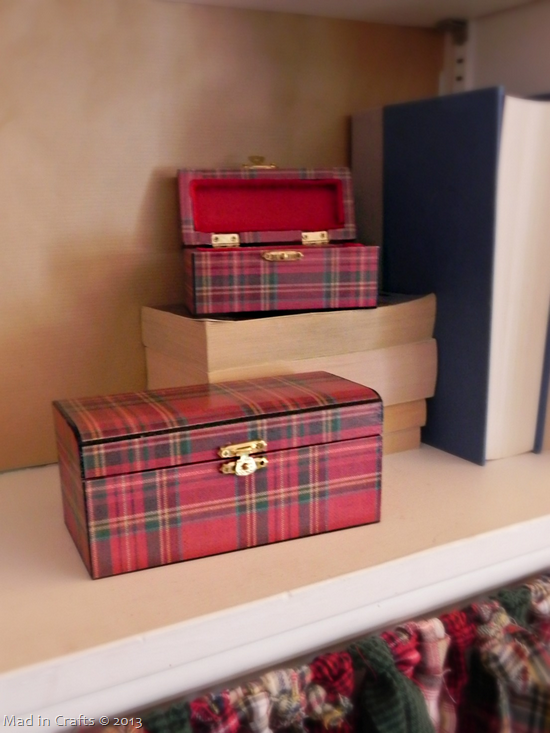 My tartanware boxes stand out much better against the craft paper than they would have in front of the teal paint. My dollar store nutcrackers also found their way back onto the shelves this year. 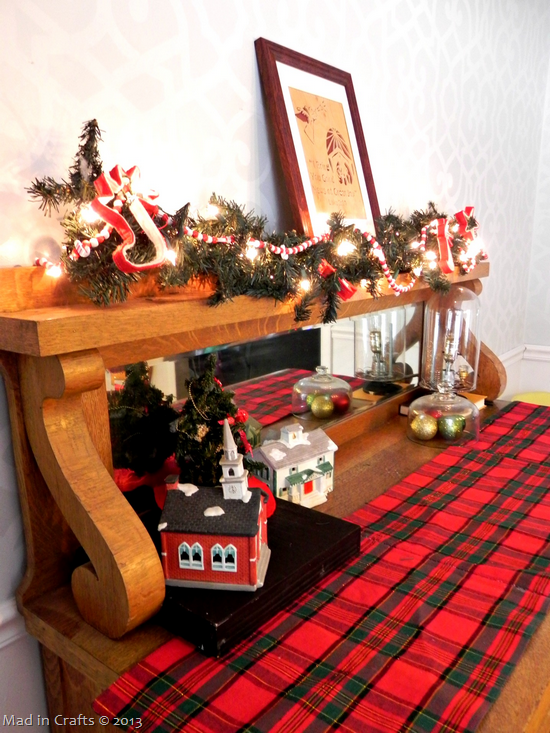 I made a long garland of one inch wide plaid fabric, knotted onto grosgrain ribbon, and hung it below the mantel. 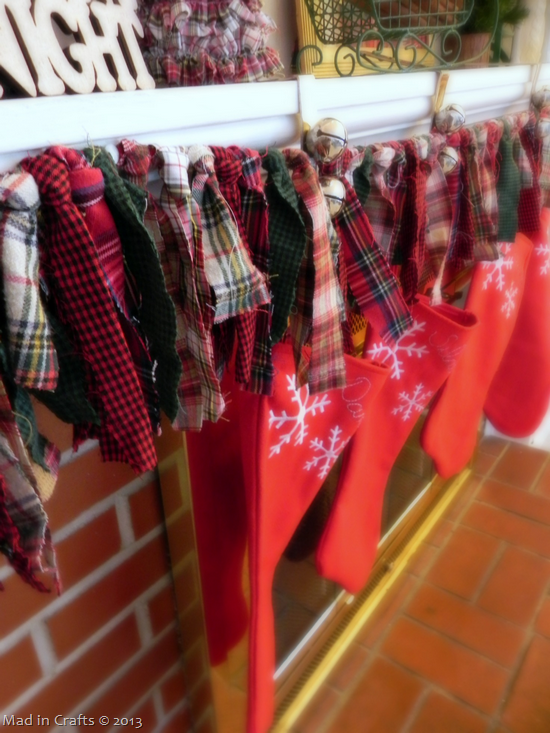 Our hand embroidered stockings hang in front of the fireplace (that I still haven’t painted or updated in any way). 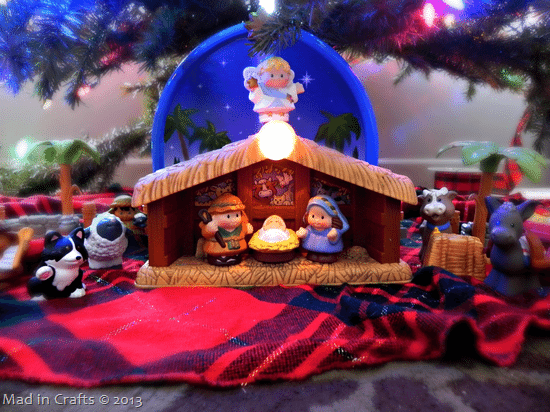 This nativity set was also a dollar store find. The metallic finish of the paint is very pretty in real life. 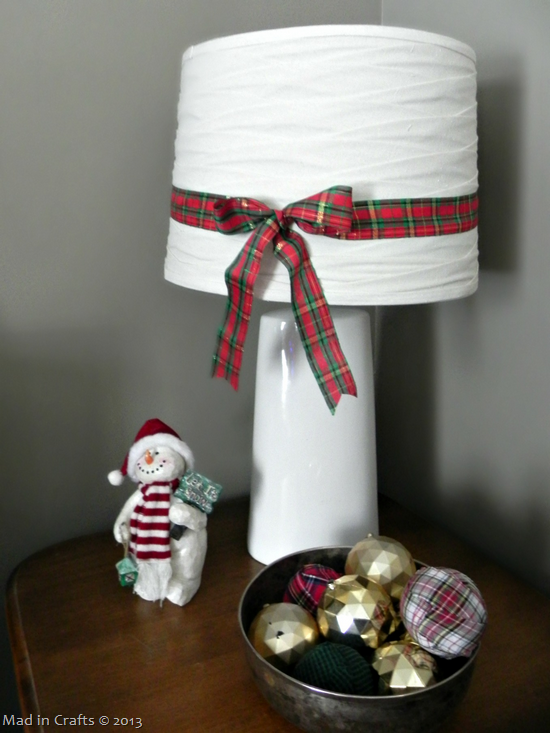 I tied some plaid ribbon around the lampshades in the living room to dress up them up just a bit. The plaid rag spheres fill up a bowl with some golden ornaments. 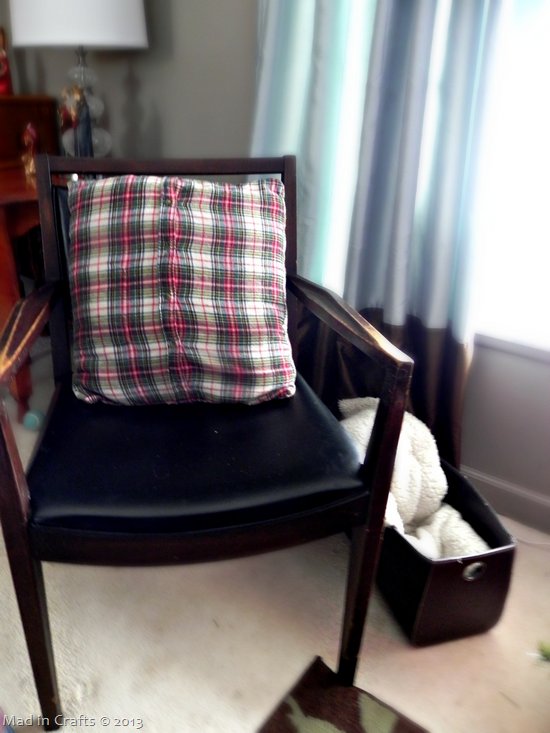 Guests can cozy up in a chair with some of the thrift store shirt pillows and gaze over at our Christmas tree. 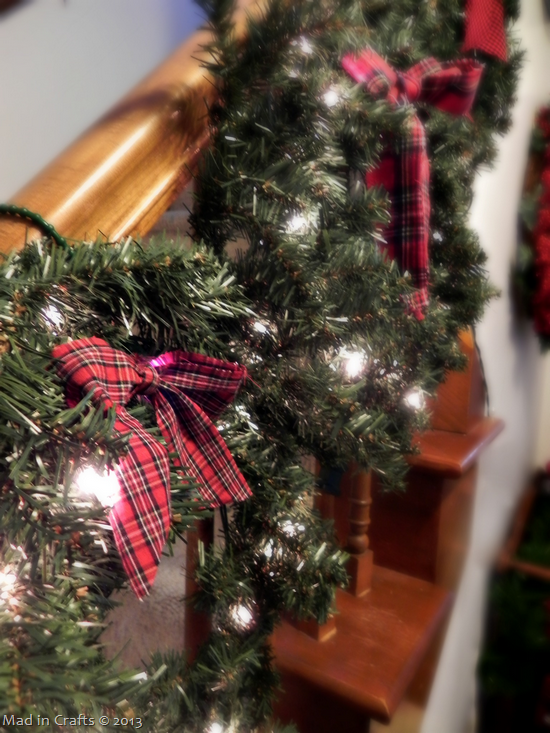 You can see that I replaced last year’s problematic garland with some wide plaid ribbon. The plaid tree skirt underneath is a round tablecloth found at a local thrift store. I just slit a radius in the tablecloth to turn it into a tree skirt that fit in with all the rest of the plaid in the room. 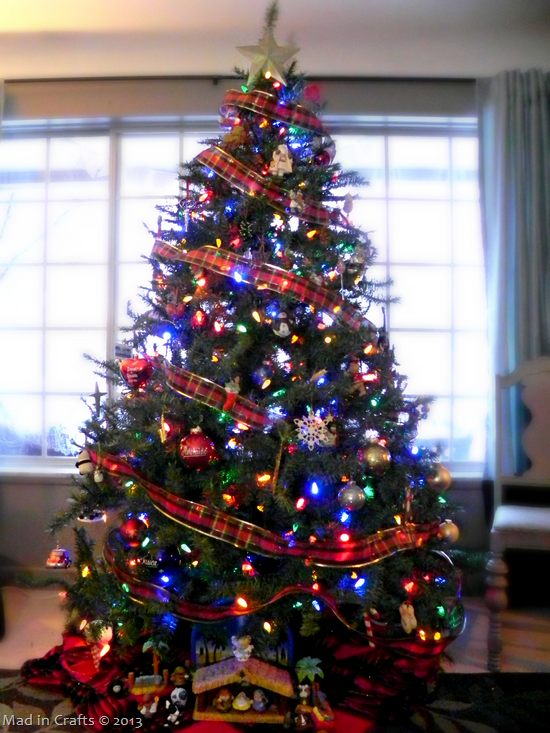 And, yes, we are probably one of the last dozen or so families in existence who still put colored lights on our tree. And not just any colored multi-colored lights, but the great big, faceted ones. They make me happy. 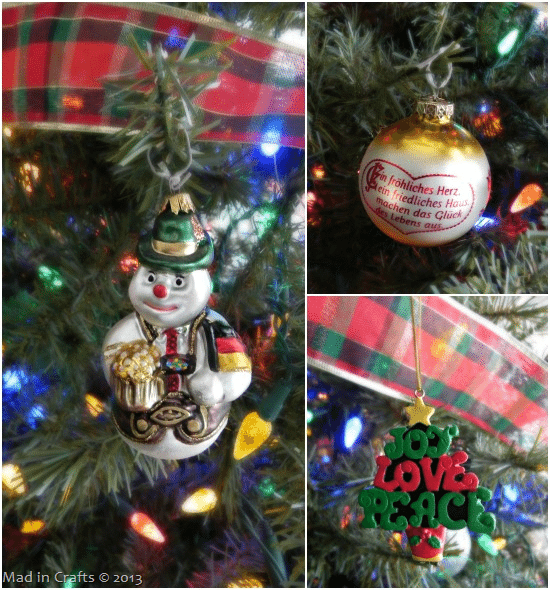 We don’t do theme trees, but instead decorate the tree with meaningful ornaments we have collected over the years. Many of them, like the ones you see above, are from Bronner’s CHRISTmas Wonderland. The kids help me decorate the tree, so the ornaments aren’t evenly spaced, but we had fun hanging them! 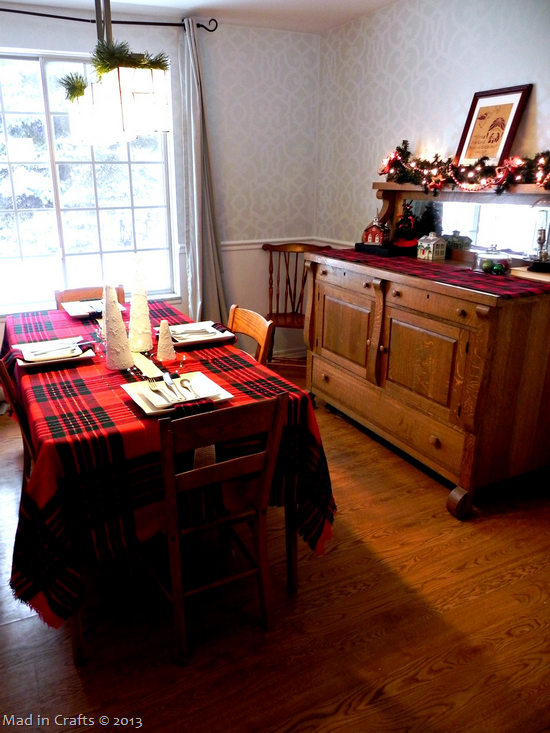 The dining room also got a Christmas makeover. 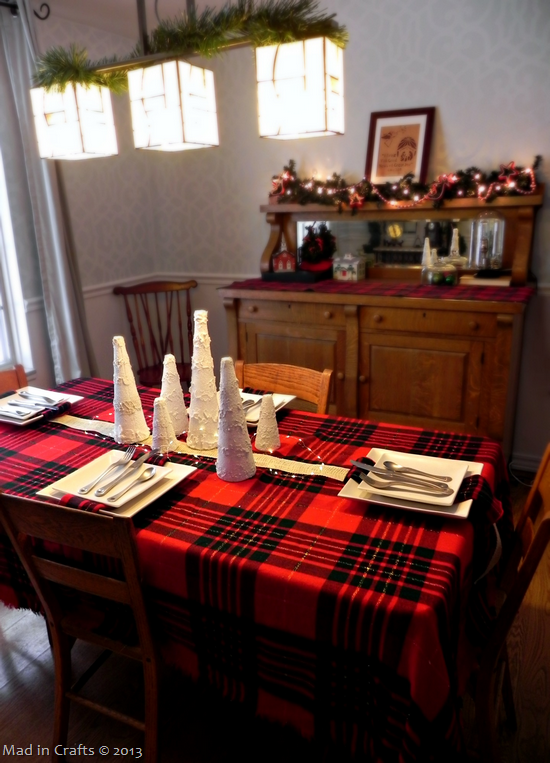 I found the plaid tablecloth and napkins at the same thrift store where I purchased the tree skirt tablecloth. 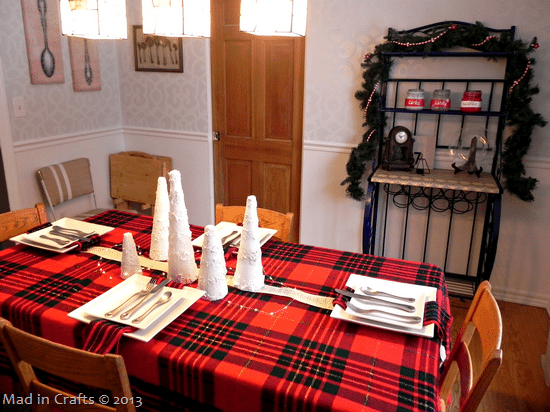 The dining room buffet got a plaid runner and some lighted garland. 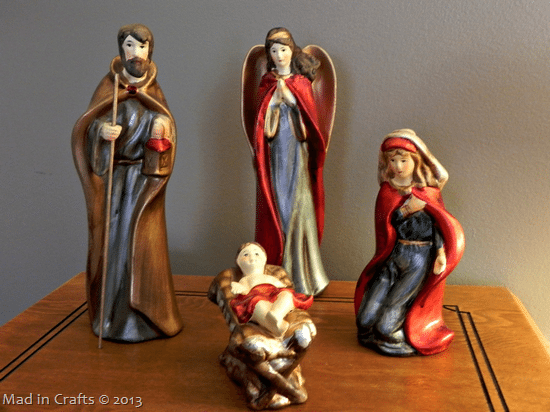 The framed wood cut nativity was hand made by a man my husband and I used to work with. Isn’t it beautiful? 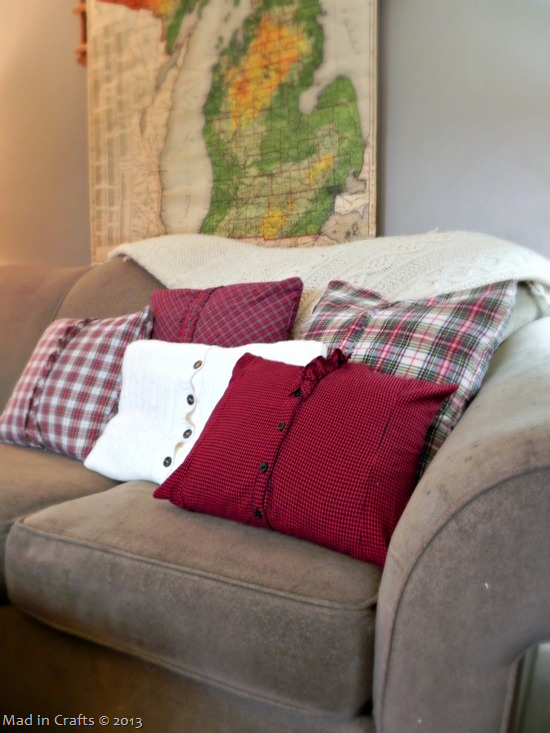 The wooden beads and felt covered cookie cutters add to the cozy cabin feel I was going for throughout the house. 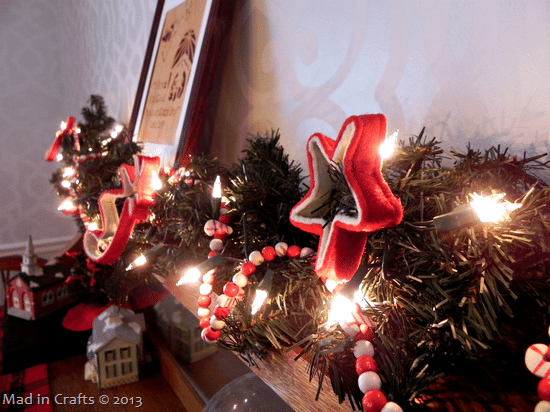 I added another evergreen garland and set of wooden beads to the baker’s rack in the corner of the dining room. 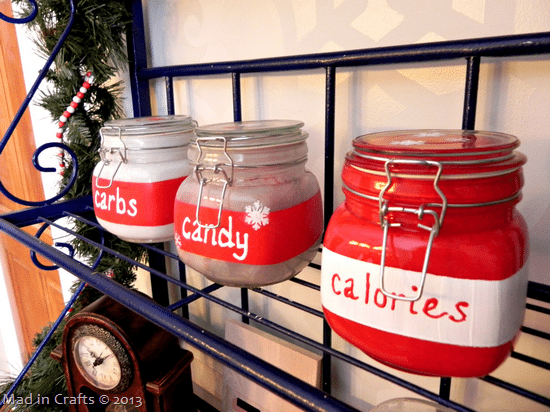 My snarky Christmas canisters that I painted a few years ago made a repeat appearance this year. They are some of my favorite decorations. 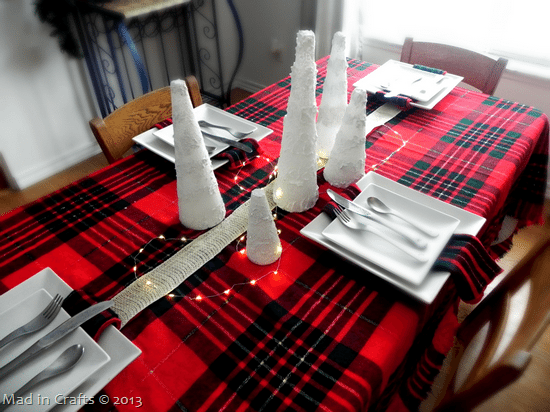 The snowy cone trees that I made this year add a simple but beautiful touch to the center of the dining room table. None of our decorations are particularly fancy or elaborate. Nothing is expensive or too precious. 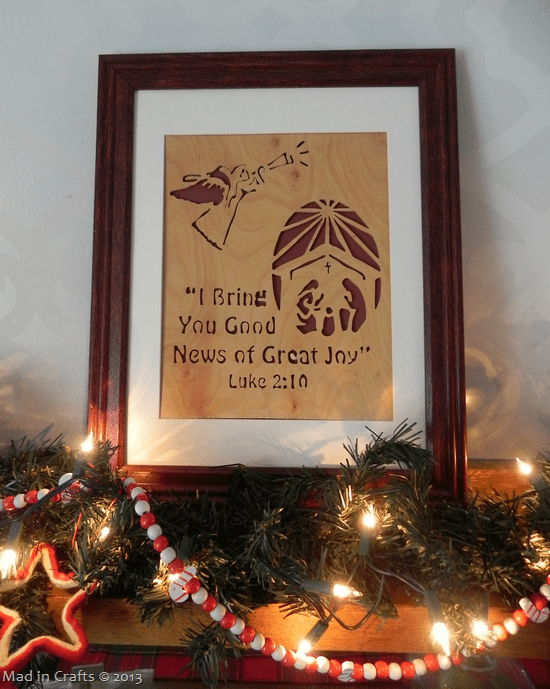 While I love decking the halls for Christmas, we try to keep the focus on the real reason for the entire season: the birth of Jesus Christ our Savior. 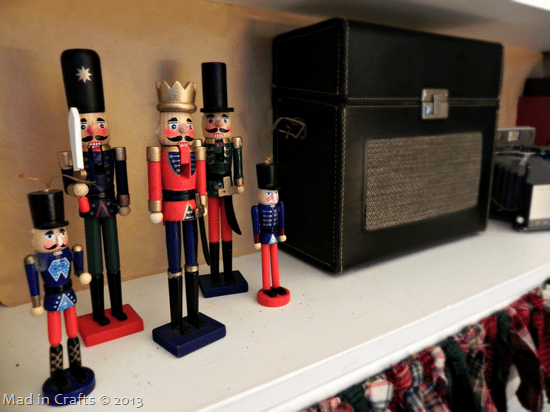 Don’t forget to check up on all the other home tours that are part of this week’s Everything Christmas Tour. Click over to my introductory post to see the week’s schedule and find links to the other tours.